There are few things that can have me in the holiday spirit nowadays. A darling friend [hi Yolanda!] sent over this beautiful arrangement. The planters sent to my family are great. 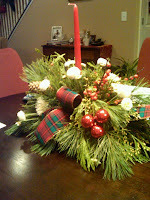 But the red candle, the berries, and tartan ribbon screams Christmas. And it's now screaming from my kitchen table. But to sweeten my night, I just had to turn to my 6 year old and her Girl Scout friends. My house came out of the evening relatively unscathed. But the girls went home full of chocolate chips, Jujubes, and candy canes. There was barely an ounce of icing found on my countertops. My usually boisterous daughter was silent for nearly an hour as she constructed her gingerbread house. I think that's the architect side of her coming out.